It's been 9 years since The Mummy moniker was used for a film, which was the reviled end to the trilogy that Stephen Sommers began in 1999. It's clear Universal had to go a different path, to not invite further comparisons to the Brendan Fraser led films (outside of the title). 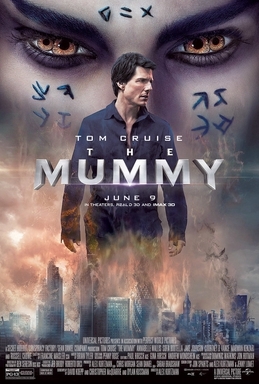 But where the previous films carried bundles of fun, this new iteration feels as though the eponymous Mummy drained any hopes of fun out of the proceedings. In present day Iraq, soldier of fortune Nick Morton (Tom Cruise) and partner Chris Vail (Jake Johnson) call in an airstrike on an insurgent stronghold. The result accidentally unearths the tomb of Egyptian Princess, Ahmanet, who murdered her family in an effort to get power, and give form to the god, Set. After Nick helps extract Ahmanet's sarcophagus onto a transport plane, a huge wave of crows cause it to crash, killing everyone onboard. Nick later awakens at the morgue, having been resurrected by Ahmanet, who's selected him to help her bring Set to life. Taking the lead role is Tom Cruise, who plays former U.S Military officer Nick Morton. It's clear this character is intended to come off as a rogue with a heart of gold, who carries a twinkle in his eye that makes you root for him.The sad reality is he's none of these. Instead, our lead is a self-centred looter, who remains underdeveloped and entirely unlikable. "I just want a hug!" After her wonderful turns in Kingsman: The Secret Service and Star Trek Beyond, the idea of Sofia Boutella playing a lead villain is an enticing one. That idea is unfortunately one we'll have to keep hoping for, as Princess Ahmanet is characterised and written as lazily and generically as her "tattoos and bandages" look. When compared to Imhotep, a hopeless romantic who wanted to be reunited with their beloved, having someone who merely lusts power and wants to raise the Egyptian devil is vastly uninteresting. Jake Johnson's only there to help the film rip-off An American Werewolf in London, while Annabelle Wallis can't overcome the weak material left for her character. The inclusion of Russell Crowe is most glaring, as him and his poor accents act as the figurehead for the forced world building that's been attempted here. His monster capturing organisation, Prodigium, is the S.H.I.E.L.D. stand in, stalling the film as it hints at the wider universe Universal is trying to cram in right here. By this point, it feels as though the requisite world building was more of a priority than crafting a decent story, or interesting characters worth getting behind. As the person kicking off this shared universe, Alex Kurtzman is responsible for setting a tone and style in the way Zack Snyder and Jon Favreau have previously done. This casts doubt over the rest of the shared universe, as Kurtzman fumbles, with the result feeling lacking in attempt. The story has been crafted by three people, while the screenplay itself has been written by three different screenwriters. Between those six people, it's understandable how much of an overstuffed mess the result is. Part Tom Cruise action/adventure vehicle, part limp horror flick, part a forced attempt at world building. There are some intriguing moments which hint at a better horror film lurking beneath, but they're lost within the identity crisis that is this film. Although, the glaring effects and pitch black settings certainly don't help things. There's one clear cut way of improving The Mummy, and that's by ending the film right after we witness Nick's death. It'd prevent viewers from having to endure an awful lead, trying to make out the poorly lit action, and enduring the crammed in moments of setting up a cinematic universe. As the inaugural entry into the Dark Universe, this garners little promise or good will for the future. As a film in it's own right, it doesn't fare much better.